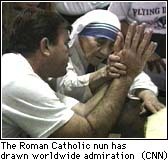 CALCUTTA, India (CNN) -- Mother Teresa has spent most of her life caring and praying for the poor, the old and the sick of the world, but as she turns 86 Monday, she's the one who needs care and prayer. The revered Roman Catholic nun showed slight signs of improvement Sunday, but remained on a respirator in intensive care at a hospital where she was struggling with a failing heart and malaria. In the midst of her physical weakness, she showed a glimmer of her spiritual strength. 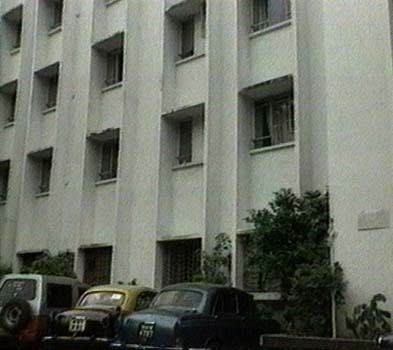 "She blessed some of the sisters of Missionaries of Charity who were allowed to see her in the evening," Dr. S.K. Sen, medical director of Woodlands Nursing Home, told reporters. "She blessed them by raising her hand gently." The missionary was taken to the hospital Tuesday with a high fever and severe vomiting. She has since suffered heart failure and was diagnosed with malaria and a chest infection. Her fever abated Sunday after days of antibiotics. "She is still seriously ill. We cannot say she is out of danger unless respiratory support is switched off," Sen said. "We are very much encouraged by Sunday's progress. By Monday, we hope things will significantly improve." Thousands of people, including Muslims and Hindus, joined in prayer for her Sunday. Catholic services were crowded at churches across India in a spontaneous outpouring of concern. Special prayers were held at the Mother House, the sprawling headquarters of the Missionaries of Charity. More than 100 nuns and volunteers gathered at mass to pray for her. "Even a maulvi (Muslim cleric) came and knelt in the chapel," said Sister Priscilla, a senior nun at the order. 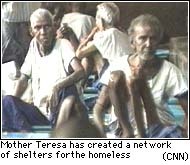 She said several Hindus and Muslims had also visited Mother House to inquire about Mother Teresa, adding: "She is a living saint for everybody here." 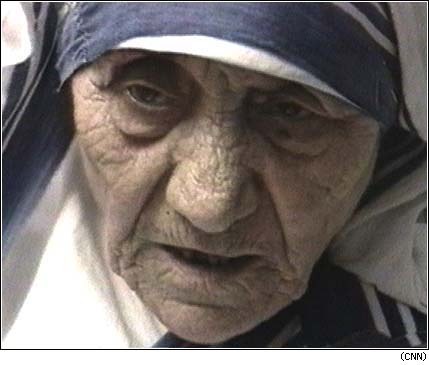 Mother Teresa's health has been in decline for more than a decade. She has suffered pneumonia, broken ribs and a heart attack, and has had a pacemaker since 1989. Correspondent Anita Pratap and Reuters contributed to this report.